Since 2012, the CSC has been conducting a cycle of evaluation surveys designed to generate insight into the experiences, achievements, and difficulties of our alumni. Respondents to the surveys are drawn from all of the CSC-administered scholarship schemes, over 60 disciplinary fields, 50 Commonwealth countries, and as far back as 1963. The cycle is now 60% complete; the remaining 40% of alumni will be surveyed in 2015. Methodological issues in research design and data interpretation have also been highlighted by the survey analysis and these, alongside indications of future directions for CSC evaluation, have been examined in the report. Several methodological recommendations for the future design of the CSC evaluation programme have emerged from the analysis. 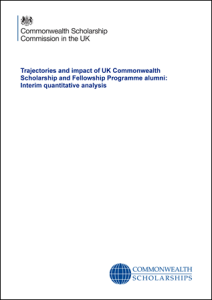 UPDATE: The full report, Successes and complexities: the outcomes of UK Commonwealth Scholarships 1960-2012, was published in April 2016.